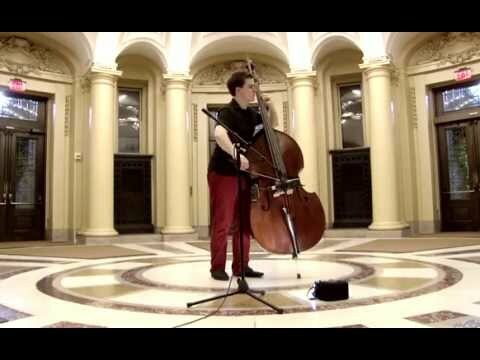 Applauded by The Strad for his “brilliant and compelling programming,” bassist Sam Suggs was named Concert Artists Guild’s New Music/New Places Fellow at the 2016 CAG International Competition, and he received an award for Extraordinary Creativity at the 2017 Bradetich Foundation International Double Bass Competition. 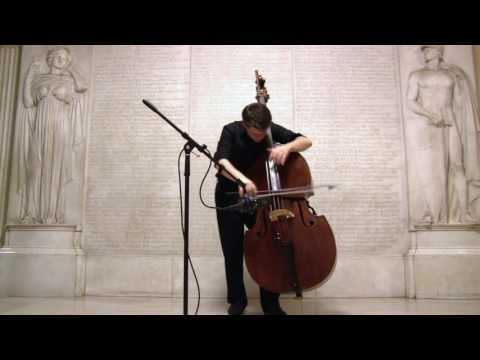 An omnivorous musician, Sam was named ‘New Artist of the Month’ (October 2015) by Musical America, soon after receiving the Gary Karr Prize for 1st place at the 2015 International Society of Bassists Solo Competition, at which he performed many of his own compositions. “What Suggs proceeded to play quite simply boggled the mind.” (Oregon Arts Watch). 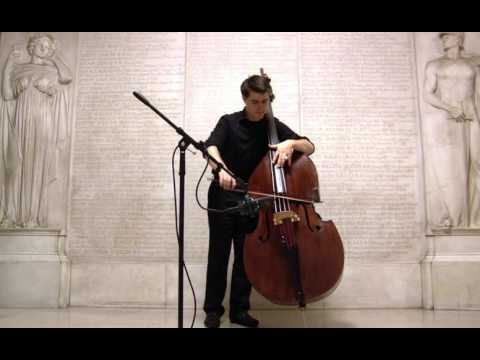 As a performer-composer, Sam is committed to expanding the literature of the double bass canon by connecting living music of the past and present–reviving old music through improvisation, composing new works in traditional styles, and also creating paradigm-shifting original music. Recent commissions sponsored by BMI/CAG and ISB will be premiered on Sam’s New York recital debut, scheduled for spring 2018 at the Sheen Center for Thought and Culture, and other 2017-18 highlights include performances at Union County Performing Arts Center in NJ and the Pittsburgh Double Bass Symposium. “Audience members sat up on the edge of their seats, leaning forward…to try to discern just how he was making the myriad sounds… I virtually held my breath all the way to the end.” (Oregon Arts Watch). A scholar of his instrument, with a particular passion about music from the 17th and 18th centuries, Sam premiered his own construction of Haydn’s lost Violone Concerto, which was the centerpiece of his ISB Competition-winning program. He has also served as principal bass of the inaugural Berwick Academy for Historical Performance at the Oregon Bach Festival, and has studied continuo and harpsichord with Robert Gjerdingen and Arthur Haas. In summer 2018, Sam will be on faculty at the Sewanee Summer Music Festival, the Milt Hinton Institute at Oberlin Conservatory and Bass Works at Peabody Conservatory. As a collaborative bassist, he has performed at the Mostly Mozart, Yellow Barn, and Mostly Music Festivals. Carnegie Hall, the Kennedy Center, and was a Protégé Artist at Chamber Music Northwest (where he additionally performed Hindemith and Frank Zappa on accordion as well as a mixture of jazz and four-hand classical piano in intimate club concerts). Sam has received commissions for fresh arrangements and theatrical/film scores from Chamber Music Society at Lincoln Center, Phoenix Chamber Music Society, Chamber Music Northwest, the Yale School of Drama and Yale School of Art. A regular member of various ensembles, he performs with Foundry (which was named a Laureate Winner in the Open Division of the 2015 inaugural M-Prize Competition), the Goliath Duo (with violinist Suliman Tekalli), the mixed chamber ensemble Founders (featuring CAG roster colleagues Brandon Ridenour, trumpet/piano and Yoonah Kim, clarinet), and also the chamber group, Frisson. In addition, he has toured through Africa and Europe with his contemporary/jazz trio, Triplepoint, and he has recorded with the Tom Bergeron Quartet. A native of Buffalo, NY, Sam Suggs spends his time between the Northeast and the Shenandoah Valley as full-time Assistant Professor of Bass at James Madison University. Sam is also nearing the completion of his DMA from the Yale School of Music, where he received a Presser Foundation Award and Dean’s Prize for the highest level of excellence. Sam also earned honors studying music theory and cognition at Northwestern University while working as the youngest principal bassist of the Civic Orchestra of Chicago, as well as a substitute for the Chicago Symphony Orchestra’s MusicNOW contemporary ensemble, and in various outreach programs including coaching the Carlos Chavez Youth Orchestra (including performing alongside Yo-Yo Ma and Emanuel Ax).